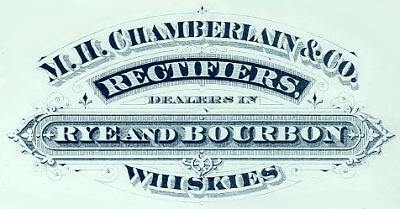 M H CHAMBERLAIN & CO.
"M. H. Chamberlain and C. H. Ritter" (1879). Ritter continues as Ritter & Co., listing from 1890 on. He also took the Chamberlain Silver Rye brand with him. 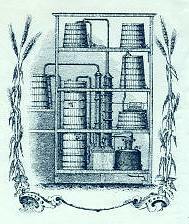 Warehouse records from 1901, 1903, and 1904 show that the company was obtaining their whiskey from the Burks Spring distillery. "Bohemian Club", and "Silver Rye." Re: M H CHAMBERLAIN & CO.